BETHESDA, MD. 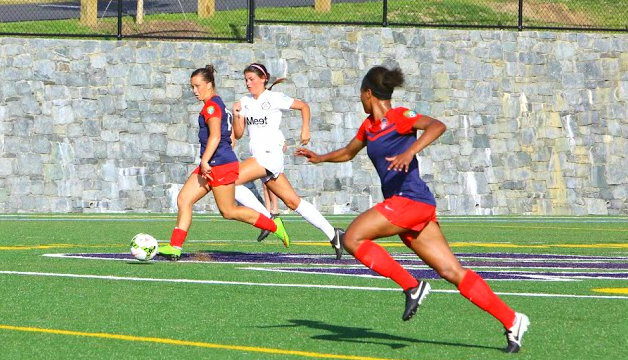 (June 26, 2015) – On Thursday June 25th, the Washington Spirit Reserves (5, 0, 2) faced off against the Dayton Dutch Lions (5, 1, 1) in their first game in two days. The Washington Spirit Reserves gave the Dayton Dutch Lions their first loss of the season with an outstanding 5-1 victory. The first ten minutes of the match, resulted in a shaky start for both sides with offensive opportunities coming for both teams. Spirit midfielder Meggie Dougherty-Howard had an outstanding night winning tackles in the midfield and playing long balls to the attacking third. A great service played by Dougherty-Howard to forward Midge Pruce using a great touch to get away from pressure, crossed the ball to Imani Dorsey in the 16th minute, giving the Spirit their first goal. Pressure from the Lions five minutes later would generate a close opportunity but the Spirit’s backline did a great job all night to stay composed and connected, clearing away any potential threats. About seven minutes after the Spirit’s first goal, the Spirit scored again with Dougherty-Howard receiving a great ball from Imani Dorsey. In the 23rd minute, the Spirit had two goals against the lead-leading Daytona Dutch Lions. Great passing in the midfield and switching fields resulted in the third goal with Dougherty-Howard again picking her head up and serving the ball behind the Lions defensive line to Sarah Zadrazil. With the Lions goalkeeper Ayanna Parker, coming out of the net, Zadrazil poked the ball around the keeper into the back of the net, making it 3-0 in the 29th minute. The Lions would not back down, and continued to apply pressure to the Spirit’s backline resulting in numerous corners in the first half. In the 35th minute, a scramble in the box after a corner caused Ode Fulutudliu to place the ball into the Spirit goal, giving them their only goal of the game. Right before the second half, Yanera Aedo, who had an outstanding game up top, served a great weighted ball from a short corner to Imani Dorsey, netting her second goal of the game with a great header. The Spirit went into the locker room controlling most of the game and having a convincing 4-1 lead over the top-ranked Dayton Dutch Lions. The second half, resulted in one more goal scored for the Spirit. In the 59th minute, Zadrazil played the ball to Pruce and with perfect placing scored her fifth goal of the season. Friday, June 26th, the Dayton Dutch Lions will be looking for redemption against the Spirit to stay close with them in the standings. After a strong 5-1 win for the Spirit, they are one point above the Lions in the standings going into their final four games of the season before playoffs.